Zazzle has great ideas for luggage tags. You can find cute, fun bag tags, and downright funny ones. You can customize them or delete the image to make your own luggage labels. I have work to do but I'm putting it off . . . on this International Workers' Day, also known as May Day. Here in Romania it's a long weekend, and most people scurried away to the beach, the mountains, or weekend trips abroad. Which is what inspired me to write this article about luggage tags. That, and the fact that search engines actually find my Wordpress.com blog now and then when people search for such things. Also, someone bought one of my own – one luggage tag I designed, I mean. 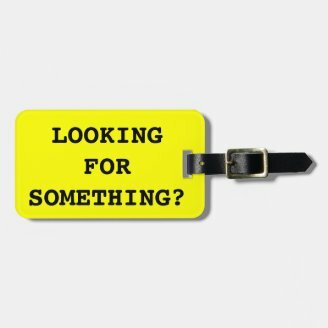 So this is an article about cute and fun luggage tags, as well as about humorous bag tags. It's also, of course, about my desire to travel, which I hope to indulge in again sooner rather than later now that I've decided I want to shake things up a bit and travel more. I didn't notice this tag on Zazzle before, and really liked it when my gaze landed on it. We've all been there: same backpack in the stow compartment on an airplane, or similar suitcases going round and round on the conveyor belt in airports. This luggage tag will sort out any confusion, most likely leaving the people involved with a smile on their faces. And no, "Looking for something?" is not the only text on this tag. Your name and address appear on the back side. Just click on the image, go to Zazzle, and click on Customize it. 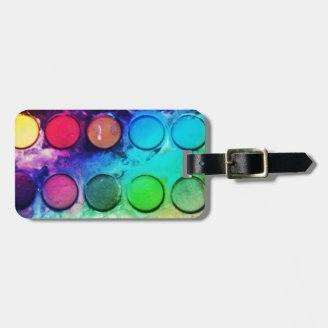 If you're an artist and want the baggage handlers and people waiting by the conveyor belt to know it, then you can choose a bag tag showing an image of box of paints. Again, you can add whatever contact info you like on the back. 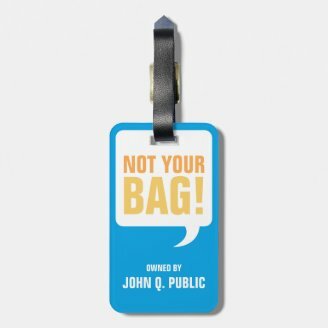 Of course, sometimes you don't want to make any statements except the obvious one: "Not your bag." There's a nice design for that, too. If you're a funny monkey in any way, and own up to it, then someone thought of you as well, a certain SJB Photos. I like this monkey, even though it can come across as rather scary to a weary traveler picking up your bag by mistake. But perhaps that's the point. 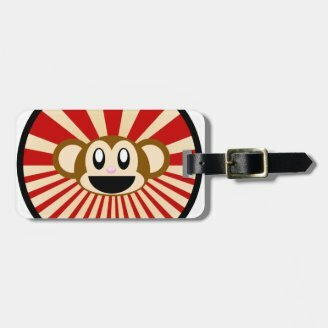 If you have a little monkey traveling with you, then Zazzle has a bag for him/her as well. I love the sea and miss going to the beach. Somehow I never made it there in recent years. This luggage tag is for those who, perhaps, go on a beach holiday, or simply like the sea, as I do. The "dream big" is a favorite mantra of the designer but also one that works well with an image of boundless sea. 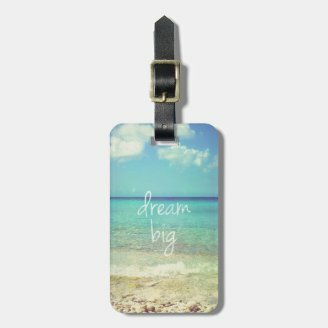 I looked on Zazzle for other images of the sea on luggage tags and couldn't find any, so if I make it to the beach this summer, I'll make some bag tags myself. If you're a feisty thing or a fan of Internet memes, Like a Boss among them, then look for luggage tags on Zazzle and you will find plenty to choose from: there's "Honey Badger Don't Care," there are many mustaches, owls, and so on. 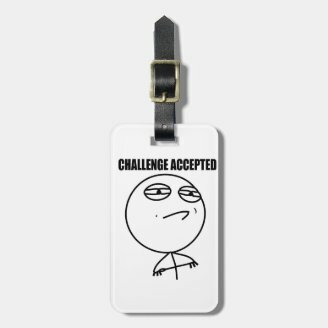 I'm showing Challenge Accepted, which may work if you're into sports, being a boss, or, well, accepting challenges. I'm also showing a tattoo owl. The image of foamy, bubbly beer is rather attractive, particularly so if you're a fan of this beverage. And heading to Munich for Oktoberfest. If you're a beer drinker, then you probably know that Oktoberfest is the largest beer-fueled fest in the world. The 6.4 million participants consumed 6.7 million liters of beer in 2013. There are smaller-scale Oktoberfests around the world, so if you can't make it to Munich, you may get your fill of German food (well, for the most part) and beer in Kitchener-Waterloo (Canada), Cincinnati, Mexico City, Blumenau (Brazil), Shanghai, city of Hong Kong, Okinawa, Canberra, and other cities. If you're a fan of baseball, you may like a tag with an image of an old baseball. Approaching the end of my list here, because I could go on forever. I just want to showcase one luggage tag with the image of a cassette tape, which reminds me of my teenage days, when there were no CDs but plenty of tapes with albums to be discovered, and many mix tapes. The tape I chose to show combines two images: a cassette tape and a cute ("kawaii" means cute in Japanese) face, with the eyes of Japanese manga characters. Finally, here's the luggage tag I created and, surprise, sold: "Because tea finds happy." It's part of a series playing with the notions of happiness and tea. I have, for instance, other products with the statements "Because happy loves tea" and "Because tea loves happy." I hope you've enjoyed my selection of fun, cute, and/or humorous luggage tags. Enjoy your travels! If you're not planning a trip but know someone who is, consider surprising him/her with a luggage tag as a way of wishing your friend happy travels! Remember that you can easily make your own bag tag. Just click on any of the images presented, delete the image you see, and upload your own photo or graphics. Also note that Zazzle has great fonts to choose from, so if you decide you don't want an image after all but rather a slogan or some other text (in addition to your name and contact info), you can easily create a luggage tag yourself. Have fun! Useful & fun - a winning combination. I think they can make a great personalised gifts as well. Good selection, Mira, and congratulations on your sell! Glad to hear that, Barb! Those are really clever tags. i've only made one so far. You've given me some fresh ideas. Thank you, Veronica. I agree, these could make great crafts projects as well. Mira I LOVE these . Apart from being fun they are so sensible and practical too and will avoid luggage mix ups to be sure. I love crafts and could make my own. Glad you like them :). I think they are very practical too, because many people own bags that are very similar. Mira, Very nice every single one! 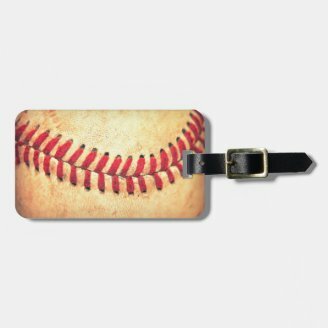 My favorite, as a long-time believer in the Chicago Cubs, is the baseball tag ;-D.
I think QuickCreate works better if you only do some of the items there. Some items just won't sell, I think, unless you have an image that matches their concept. I'm thinking of belt buckles, clocks, playing cards, etc. I think playing cards go well with geometric designs, for instance. And then you can't use those for other items. So you're pretty much designing for only a handful of items most of the time. It gets better with photos, though, which is why I intend to use more photography in my store as well. 100 items in 2 seconds, but how much of it is thoughtfully created with care, love and attention to detail for how it would look? I haven't sold a thing (yet) but that may well be because I simply hit 'quick create' and plastered my five favorite photos over every available object when I first signed up. Now I need to go back and realise that some of the items just aren't going to work. Babies' dummies with autumn scenes on won't sell. I need a cute fuzzy teddy bear for that. I love the idea of creating a tie, but I notice that the design is only on the front, not the whole tie, which isn't much use. I'm getting better at postcards, mugs, luggage tags and T-shirts, though, I think.